As a land-locked country with no coastline, it may come as a surprise to learn that Hungary has ever needed or wanted a battleship. But, in the years before World War 1, Hungary was part of the Austro-Hungarian empire. The empire’s political system meant that, when Admiral Montecuccoli announced the building of a new generation of battleship in 1908, the Hungarian parliament could insist that one of the new class be built in Hungary, and be named Szent István, for Hungary’s patron saint. Funding for this new class of ships was initially refused by the parliaments, on the grounds that the army needed the money to administer Bosnia and Herzegovina, which had recently been annexed into the empire. None the less, the first keel was laid down on 24th July 1910, but only after Montecuccoli had persuaded the Emperor to authorise construction on credit, and personally guaranteed a 32 million Kronen credit. The contractor for all recent Austro-Hungarian battleships had been Stabilimento Tecnico Triestino in Trieste, and they were to build the other three ships of the class, but Szent István was to be constructed by Danubius of Fiume. Danubius, set up and subsidised by the Hungarian government, had no experience of large ship construction. Consequently, Szent István cost more, and took longer to complete, than the other three ships of the class. The Tegetthoff class was the first dreadnought to use triple turrets, with the main armament of 12 30.5cm guns in four triple turrets along the centre line. These turrets were arranged in superimposed pairs, fore and aft. This configuration kept the overall length of the ships down, but the combination of large guns on a relatively short hull meant that stiffeners had to be fitted under the turrets to prevent hull distortion. The triple turrets created another problem. Each turret had only two cordite hoists and two shell hoists to serve the three guns. Secondary armament consisted of 18 single 15cm guns, and tertiary armament was 12 single 6.6cm guns. Four 21″ torpedo tubes were fitted below the waterline, in the bow, stern and each beam. Six of the 15cm guns were later removed, so she only had 12 at the time she was sunk. The main armoured belt was 150mm at the waterline, 280mm above it, with a 36mm deck. The triple turrets had 305mm of armour, while the conning tower had the thickest armour on the ship, at 356mm. Underwater protection included an armoured mine bottom (minenpanzer), invented by the Austrian ship designer Siegfried Popper. 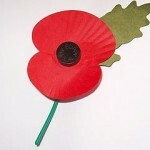 This was intended to provide protection against mines, but its effectiveness was doubtful. Longitudinal torpedo bulkheads were fitted to both sides of the hull, but the space between them and the hull was too small to contain the expanding gasses from a torpedo hit. A framework was fitted above the funnels and covered with old anti-torpedo netting to offer some protection against bombs. Unlike the other ships of the class, Szent István was fitted with a platform running from the bridge to the after funnel, on which six searchlights were fitted. Propulsion was provided by steam turbines with 12 boilers. These provided around 26,400shp to four screws. The maximum speed is not known, since the war prevented her running proper trials. The other ships of the class had a maximum speed of 20.3 knots, so it is likely it would have been roughly the same. Sufficient fuel was carried to allow the ship to travel 4,200 nautical miles at a speed of 10 knots. Unfortunately, Hungary’s first and last capital ship was not built to a very good standard. During her trials in 1915, the shock of firing the main armament blew rivets out of her bottom, and officers complained about her stability after she took on a 19° list during a high-speed turn. Calculations carried out after the trials showed a significant difference with the calculations made while the ship was being built. The errors in the theoretical calculations made during construction had led to excess top weight, leading to the ship’s instability. Another serious fault reported after the trials was that ventilation ducts, which passed through the watertight bulkheads, could not be secured in case of flooding. Incredibly, this meant that flooding could spread between compartments even when the ship was closed up for action. None the less, even with these defects, the ship was commissioned into the navy. 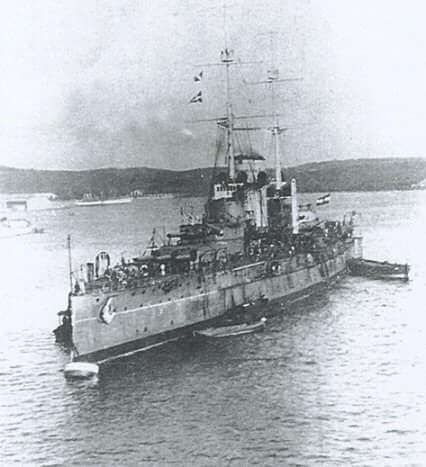 When war broke out in 1914, Szent István was still fitting out at Fiume. She was towed to Pola for completion, and joined the fleet in November 1915. Due to her late completion, she missed the bombardment of the Italian coast in May 1915, the only time the Tegetthoffs fired their guns in anger. Unwilling to risk a fleet action, the naval high command left the four Tegetthoffs at Pola, until June 1918. Admiral Nikolaus Horthy, the navy’s new commander in chief, planned to carry out a raid on the Otranto Barrage, at the same time as the army began an offensive in northern Italy. The plan was to raid the barrage with light cruisers and destroyers, in the expectation that the allies would send a force of light cruisers and destroyers, as they had with previous raids. This force would then be met by the large guns of the four Tegetthoff battleships. Due to logistical problems, the army was unable to start their attack on the planned date, but the navy’s attack went ahead anyway. Szent István and Tegetthoff sailed from Pola on 9th June. Problems were encountered almost immediately, when the anti-submarine boom at Pola could not be opened. The delay was exacerbated when Szent István developed turbine trouble and had to slow to 12.5 knots. As the ships headed south, two Italian motor torpedo boats, MAS 15 and MAS 21, were waiting for the torpedo boats 15 OS and 18 OS, which were to tow them back to Italy. However, at 03:15 on 10th June, smoke was sighted to the north, so the MAS boats changed course to intercept, approaching the dreadnoughts from their starboard side. MAS 15, commanded by Capitano di Fregata Luigo Rizzo took the Szent István as its target, while MAS 21, commanded by Guardiamarina Armando Gori, took Tegetthoff. At around 03:25 the boats each fired two torpedoes, but those from MAS 21 failed to run. MAS 15 was luckier, however, and both her torpedoes hit Szent István amidships. Having fired their torpedoes, both MAS boats left at full speed, pursued by the escorting destroyers. Tegetthoff left the formation after the attack, increased speed and started violent zigzag evasive manoeuvres. Numerous false periscope sightings were reported and fired upon, but by 04:45 things had calmed down sufficiently for Tegetthoff to return to the Szent István. After being hit, Szent István’s after boiler room began to flood, and she listed 10° to port. Starboard compartments were counter-flooded, reducing the list to ﻿7°, but the shoddy riveting gave way, causing the forward boiler room to flood. The list returned to 10°, and with almost all the boilers off line, there was only enough power for rudimentary lighting. With no power to operate pumps and interior bulkheads collapsing, the list steadily increased until at 06:05, she capsized, and at 06:12 the hull sank. When Admiral Horthy in Viribus Unitis heard of the loss, he concluded that the mission had been compromised and ordered the fleet to return to Pola. So concluded the last occasion that the Austro-Hungarian fleet put to sea, and the end of Hungary’s first and only battleship. This article was originally published in the Society of Twentieth Century Wargamers Journal.